Ok, firstly can I just get something out of the way? Eeeeeeek I have a Pink Lining bag!! Right now I have that out of my system . . . . . .
Let me start by telling you how absolutely gorgeous this Mini Yummy Mummy bag is, it looks and feels fantastic quality, is 100% cotton canvas and laminated with EVA coating. Don't be fooled by the title "Mini", I was pleasantly surprised by how much I could fit in. Left: all of these items are inside the bag in all of the photographs. Right: some of the quality attention to detail. I easily fitted in my large purse, phone, a full pack of wet wipes, a nappy, packet of tissues, a carton of orange juice, some hand sanitiser, a mandarin and a box of raisins. Also to the right is the pink travel changing mat which comes in its own external pocket in the bag. I have used the strap to attach the bag to the handle of my pushchair, it has been a godsend for keeping to hand all of the essentials for Liv and my purse, phone keys etc. The fully adjustable strap ranges from approximately 27 - 49.5 inches which allows it to be hung on your pushchair, worn as a handbag or even across the body. Left: front view of the bag, the cream are is a zipped pocket. 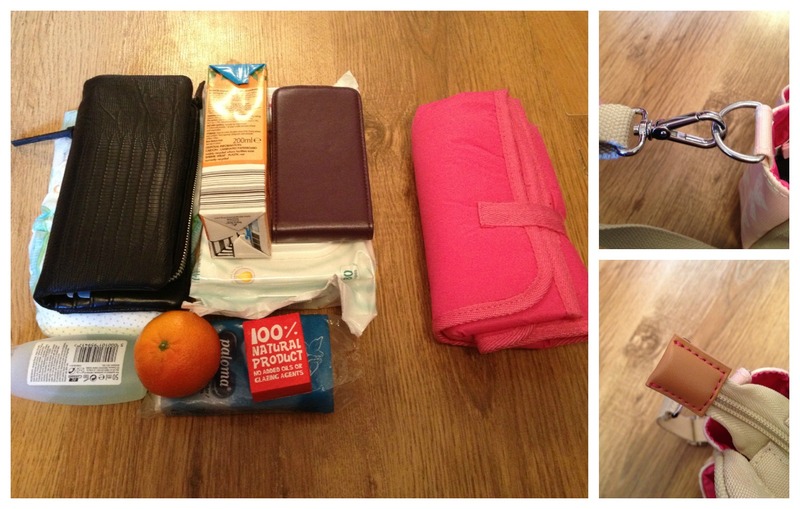 Bottom right: the reverse of the bag, the changing mat is stored in this external pocket which has a magnetic popper. 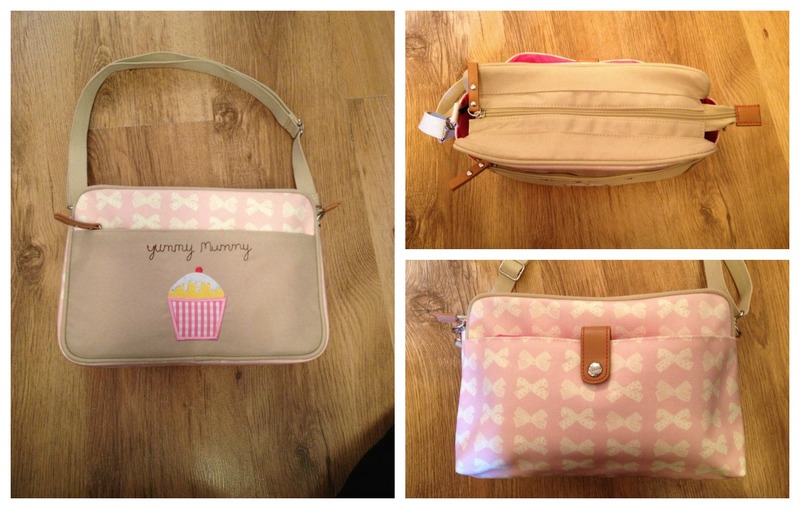 The cream bows range is also available in several full size changing bags, a bottle holder and purse. My Husband will be confiscating my bank card . . . . .
Left: the changing mat compartment. Right: the all important pink lining, complete with pockets and zip sections. I absolutely adore this bag and would 100% recommend it, you will not be disappointed! I was sent this bag for the purpose of the review, all opinion and wording is my own. This looks like my ideal bag! Wow love it - it looks great! I would love a Pink Lining bag! My changing bag is falling to bits! Great review, want one even more now! That is a really pretty bag. 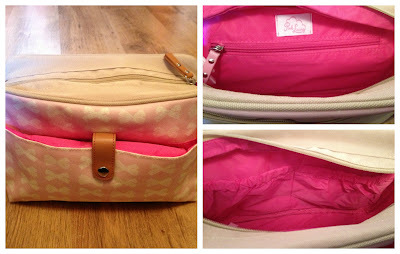 I think Pink Lining do some beautiful changing bags but they are sadly out of my budget! I have wanted one of these for so long! Gorgeous bags. Love love love that bag! This is what happens when I say smile!